When a great dam was built by the Kielder Water in Northumberland, the valley below slowly filled with water. But just before this, when the villagers had been moved out, two musicians went back to the abandoned valley. They tore down the boards over the houses, stepped inside and started to play – for this would be the last time that music would be heard in this place. 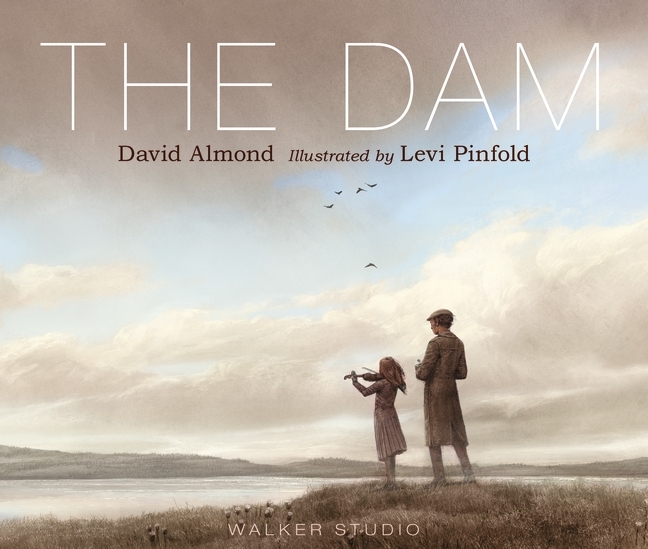 In this astonishing picture book that combines themes of loss, hope and music David Almond pays homage to all musicians, showing the ancient and unstoppable power of creativity. David Almond has received several major awards, including a Hans Christian Andersen Award, a Carnegie Medal, two Whitbread Awards, an Eleanor Farjeon Award, and a Michael L. Printz Award. He is known worldwide as the author of Skellig, Clay, and many other plays, stories, and novels, including The Boy Who Swam with Piranhas, illustrated by Oliver Jeffers; The Savage, Slog’s Dad, and Mouse Bird Snake Wolf, all illustrated by Dave McKean; and My Dad’s a Birdman and The Boy Who Climbed Into the Moon, both illustrated by Polly Dunbar. Levi Pinfold studied illustration at University College, Falmouth where he developed his distinctive stylized realism. He has won numerous awards for his picture books, which include The Django, Greenling and Black Dog, which won the Kate Greenaway Medal.